The citizens of Japan are dealing with a tragic chain of events. Please consider making a donation at RedCross.org. Or, you can text REDCROSS to 90999 and automatically donate $10. I first encountered Japanese woodblock prints – specifically those done in the traditional Ukiyo-e method – on a visit to the Museum of Fine Arts in Boston. Katsushika Hokusai’s (1760-1849) print The Great Wave Off of Kanagawa (part of the series 36 Views from Mount Fuji), has been reproduced on everything from mugs to t-shirts to calendars, and is probably the example most readers are familiar with. But my favorite artist of Ukiyo-e is Hokusai’s contemporary Utagawa Hiroshige (1797-1858). 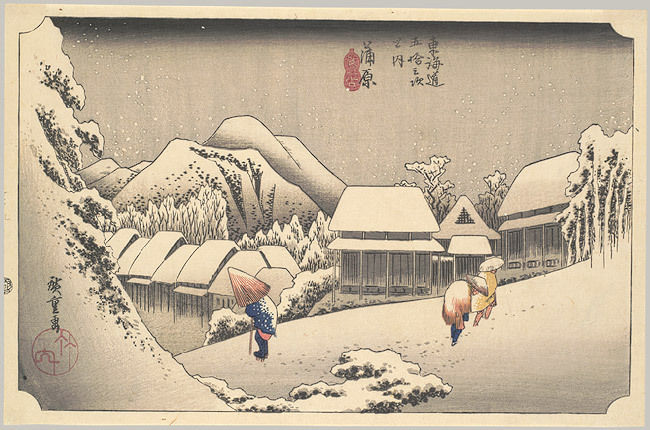 Hiroshige’s compositions are the more dynamic. His series One Hundred Famous Views of Edo pushes the limits of the medium and the two-dimensional plane. A Ukiyo-e print requires the combined labor of several artisans. The artist (for example: Hiroshige) creates the drawing. But it is the carver who translates the image into wood. He performs a kind of color separation, assigning each color (or pattern, or special effect) to an individual block. Each block contains only a small portion of the picture and a finished print can take anywhere from 10-25 carved blocks. The blocks are then turned over to the printer. The printer applies ink to each block and positions the paper on it, face down. The image is transferred (by hand) by rubbing the reverse side of the paper carefully with a special tool. After it dries, the printer then lays the same sheet of paper onto the next block, working through all the color blocks – achieving perfect alignment by fitting the corner of the sheet into a right angle impression carved into the corner every block. It’s a labor intensive process but the resulting prints are exquisite – allowing for incredible detail, while appearing deceptively simple on casual inspection. Reproductions in books rarely do these pieces justice. It’s only in person that you discover the subtle shading, the mica embedded into the background 0f a night sky, or an embossing detail the printer used to create the white-on-white effect of snow falling onto piles of already drifted snow. These pictures are painstakingly crafted, and meant to be enjoyed, one layer at a time. What has all this to do with Haruki Murakami’s Sputnik Sweetheart? The novel left me with the same sense of careful construction and of a shared Japanese aesthetic. Murakami’s novel is narrated by a young man known only as “K.”, who tells us the story of his relationship with a strange and dishevelled girl named Sumire. K. is Sumire’s best friend, her confidant and her support system as she struggles to become a writer. A classic love triangle develops. Our narrator is in love with Sumire. Sumire, in turn, falls in love with a sophisticated older business woman named Miu. Their affair causes Sumire to change her life, her appearance and her attitude. She begins working for Miu and stops writing. The two travel together, and while vacationing on a secluded Greek island Sumire mysteriously disappears. Miu calls K. and requests that he come to the island to help search for the missing girl. What he discovers when he gets there is both haunting and, at least for this reader, frustratingly unsatisfying: two manuscripts left behind by Sumire – both of which create more questions than they provide answers. The first part of Sputnik Sweetheart provides background on K.’s relationship with Sumire; the second part recounts Sumire’s love affair with Miu. The third, and final part, deals with Sumire’s disappearance and our narrator’s search for answers. (This breakdown of the book is mine, by the way, not the author’s. The book is divided into 16 chapters). Like the Ukiyo-e print, the story of K., Sumire & Miu develops in layers. There is the three parts of the plot I described above, the two manuscripts, and then a third story of sacrifice that K. tells Sumire to encourage her to have faith in her talent as a writer. Each of these plot devices is skillfully written, well-developed and interesting in and of itself. But they never clicked into place to form a complete picture. To further confuse matters, Murakami hints at (but never confirms) a science fiction twist at the end. 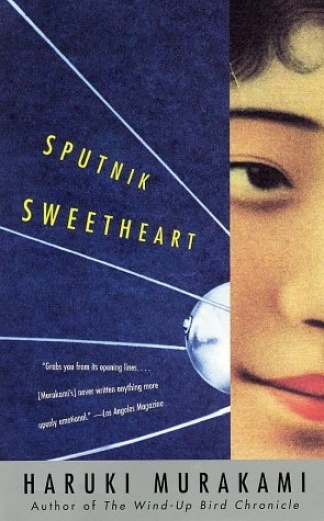 In some ways Sputnik Sweetheart reminded me of the novel and 1975 film Picnic at Hanging Rock , though Murakami is inarguably a better writer. Haruki Murakami’s prose is everything I could hope for in a Japanese author. Concise, lovely, evocative – incredibly detailed while appearing deceptively simple like a Ukiyo-e print. There is a powerful awareness of space, the setting of each scene defined by K.’s perspective. The reader moves with him from room to room, whether in a cramped apartment at 2AM, a security guard’s dingy office, Sumire’s abandoned room on a Greek island or the inside of a ferris wheel car at night. Sputnik Sweetheart is a series of small compositions – which is why it is so pleasing and where it disappoints. If I were to go back I would not choose this novel as my introduction to Murakami’s writing. Still, what I discovered in its pages has sparked a desire to read more. Next postThe 2011 Man Booker International Prize. Judge for Yourself!